On reefs all across the Fiji Islands, volunteers from schools, universities, conservation organisations, resorts and dive operations took part in 30 minute counts of Butterflyfish, as an indicator of biodiversity and coral health. See www.Fijibutterflyfishcount.com for full details and results as they come in. 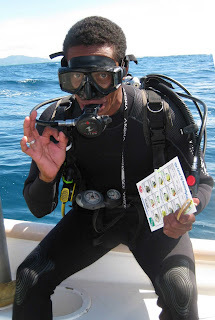 The Great Fiji Butterfly Fish Count 2008 launched at FIHTA Dive Fiji EXPO 2008 This was launched here..